Of all the celestial wonders that the night sky treats us to, the northern lights are probably the most incredible. Seeing the swirling aurora borealis with your own eyes is indescribable and there's a reason people travel all the way to Scandinavia just to scope it out. 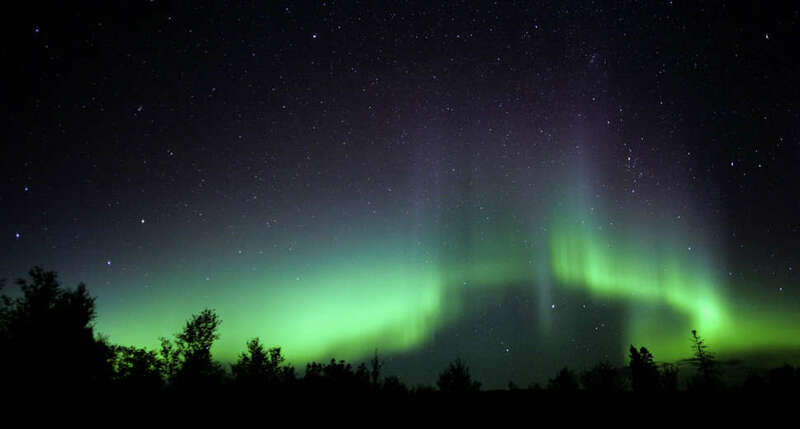 However, some lucky Americans will get to see the light show from the comfort of their backyards this weekend, since there's a chance the northern lights will be visible across parts of the northern United States on the night of Saturday, December 1. According to a new geomagnetic storm warning issued by the Space Weather Prediction Center (SWPC), the northern lights will be visible between December 1 and December 2 due to an "anticipated influence from a recurrent, positive polarity coronal hole high-speed stream." In other words, the area where the northern lights may be visible will be much larger than usual and include areas in the northern US. Specifically, the SWPC predicts you may be able to see the dazzling display from areas as far south as the green line on the above map. That means that, potentially, residents in parts of Montana, North Dakota, Minnesota, Wisconsin, Michigan, and Maine will have a chance to see the big show in the sky this weekend. As usual, people in Alaska should have quite a good view, too. 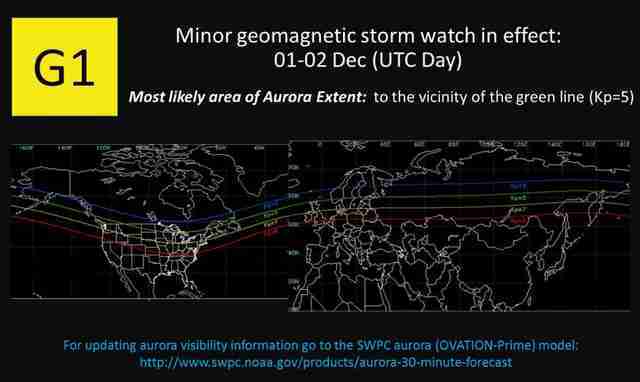 The storm watch begins Friday November 30 at 7pm ET, but according to the 3-day forecast, the aurora will be at its most visible in the States between 7pm Saturday, December 1, and 1am Sunday, December 2. Of course, it's not guaranteed you'll be able to see it, as there are other factors such as your local weather conditions that are out of your control, so keep your fingers crossed that skies remain clear. Also, for the best chance to see the lights it needs to be dark. Like, really dark. So, do what you can to escape any light pollution that may interfere with the show. You'll want a clear view of the northern horizon (that means no trees or buildings blocking it), since that's where you'll need to be looking. Sure, you may have to put in a bit of work to set yourself up for an optimal viewing experience, but you never know the next time you'll have another opportunity to glimpse the colorful ripples in the sky. And at least it's the weekend, so you can sleep off your late night adventure into the cold on Sunday.